Battle of the Bands contests have been going on for decades. Hundreds take place every year. But who wins, and who loses? The bands, the fans, or the brands who sponsor them? In this latest episode of Live Fix Radio we continue our exploration of this ever evolving culture of artist competition, brand promotion and fan discovery. To get the band perspective, we talked with Don Mitchell (guitar, vocals) from string-rock quintet Darlingside, one of the finalists in the Sennheiser Hear. I Am and picktheband.com contest. We asked Don why the band entered the contest, how they mobilized fans with social media during the voting stage, and what they learned after they won the trip to play the SXSW 2011 showcase. And going beyond the contest, Don shares a fun, yet bizarre, personal concert story that involves an unexpected connection between Spinal Tap live and A Mighty Wind. During the show we mentioned that we didn’t have the chance to talk to a fan at the time we recorded the show. Well, we’ve got some great news! We did hear back from Scott Warren, one of the concert fans who won a trip to the SXSW during the Sennheiser contest showcase. Our email chat with Scott follows the show notes below. Ongoing Live Fix explorations and interviews with BOTB bands and brands: JanSport, Shure and others. History of Battle of the Bands via Google and via Wikipedia. LF: What did you enjoy the most about the Sennheiser contest? Do you think Sennheiser did a good job of creating a contest that showcased new music and celebrated the concert fan experience? What could they have done better for the fans? Scott: Obviously, I enjoyed winning the most! In all seriousness, I appreciated how the contest promoted indie artists to new fans. By offering such an exciting prize to both fan and band, Sennheiser created the perfect incentive to participate, promote and discover. I’m friends with two of the bands (The Robotanists and Ryan Hill), but I enjoyed checking out the other bands in the contest as well. What was your most memorable moment at SXSW 2011? Have you been there before? I swear they didn’t pay me to say this, but I loved the moment when we finally arrived to the Sennheiser showcase. Their representatives bought us drinks, we were taking pictures with everyone. The treatment was so nice, I felt like we were the headlining act. Then I turned around and realized The Antlers (an indie artist I’d recently come to love) were performing. It was all working really well. I’d been to SXSW before, but this was the first time I had a chance to bring people along with me. Having my brothers on board made the trip pretty special. 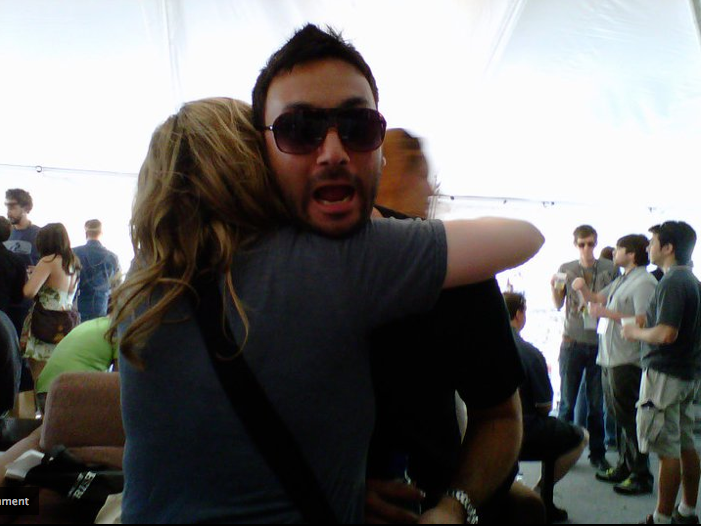 Scott: "being hugged during the show with sunglasses"
What are your 5 most memorable live music experiences? And how have those experiences changed your life? – Jackson 5 at Dodger Stadium (1984). Jackson 5 was my first concert ever. If that didn’t change my life, I don’t know what would. 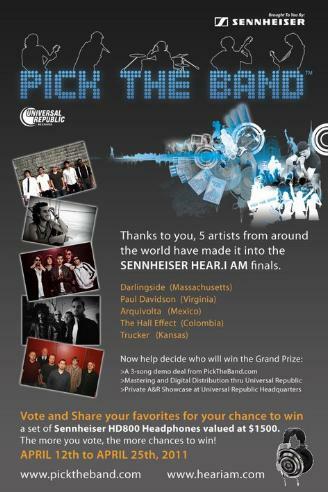 If you could make the Sennheiser contest more fan-centric, how would you do so? Perhaps the contests can involve more “social” interaction – something along the lines of a better executed Ping. However, I like how the contest is about the bands. Our job as fans is to support the artists creating the music we love. Any tips for other fans thinking of entering a future contest? I don’t know why a fan wouldn’t want want to enter a future contest. You’re being asking to discover new music in return for a chance to win an unforgettable experience. That sounds worth it to me. Thanks again for listening to the Live Fix Podcast! Subscribe via iTunes. We want to hear from you — post your questions, thoughts and feedback about this podcast in the comments below.